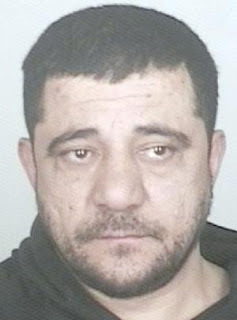 Hussain Alhussaini, a 45-year-old homeless man, was arrested after allegedly striking another man in the face with a beer bottle, opening a large gash on the man's cheek. Then came the surprise. Readers commenting on a story about Wednesday's arrest on The Patriot Ledger's website noted that a man with the same name was mentioned prominently in a book about the deadly bombing of an Oklahoma City federal building in 1995. By Thursday afternoon, police had contacted the FBI and spoken to the book's author.Jayna Davis, author of the 2004 book "Third Terrorist: The Middle East Connection to the Oklahoma City Bombing," said she asked a Quincy police detective if Hussain Al-Hussaini, the man police arrested, had a tattoo of an anchor with a snake wrapped around it. He did. Police sent her a photo of him. "His age, his name, the picture, the mug shot – that's him," Davis told The Patriot Ledger via telephone after speaking with police. She said the anchor-and-snake tattoo was common among members of a branch of the Iraqi army under Saddam Hussein. An FBI spokesman in Boston, Greg Comcowich, said Thursday night that a man named Hussain Al-Hussaini was "thoroughly investigated" in connection with the Oklahoma City bombing and "was found to not have any role whatsoever in the attack on the Murrah Federal Building in 1995." "The investigation was closed and the FBI has no further interest in that individual," he said.Comcowich said he could not confirm whether the Hussain Al-Hussaini arrested in Quincy was the same Hussain Al-Hussaini investigated after the Murrah Building bombing. The Al-Hussaini investigated in the bombing sued Davis, a former television reporter, and Oklahoma station KFOR for a story that indirectly identified him as a potential bombing suspect dubbed "John Doe 2" by investigators. Al-Hussaini's lawyer at the time claimed he was singled out because he was an Arab, according to a 2002 report in The Wall Street Journal. Al-Hussaini claimed defamation, invasion of privacy and emotional distress. His suit was dismissed by a federal judge before trial after the defendants' request for summary judgment. Al-Hussaini appealed the ruling but the decision was upheld. Hussain Al-Hussaini, 45, was arrested around 7:30 a.m. Wednesday near 1250 Hancock St. and charged with assault and battery with a dangerous weapon. Police allege he slashed another homeless man's face with a beer bottle. Al-Hussaini was ordered to have no contact with the victim, a 37-year-old who was taken to Boston Medical Center, and to stay away from the Father Bill's homeless shelter in Quincy.